The one greaseless product that will lubricate, penetrate, clean and protect in a wide range of applications and in freezing weather. 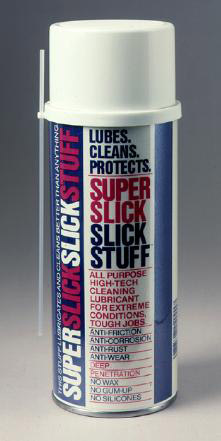 Unlike other lubricants, SuperSlick does not contain mineral spirits, kerosene, or other additives such as wax, silicones or Teflon that can gum up the works. Great for bicycle chains, fishing equipment, reels, outboard motors, and other valuable equipment. Solves more problems for a longer time.